The Women of Achievement Awards is the YWCA Lower Cape Fear’s signature fundraiser to recognize and celebrate the accomplishments of women and young leaders in our community. Since 1985, we have honored over 400 women. The event raises key support for the YWCA’s advocacy programs and services which promote racial justice and gender equity for thousands of women, children and their families in southeastern North Carolina. 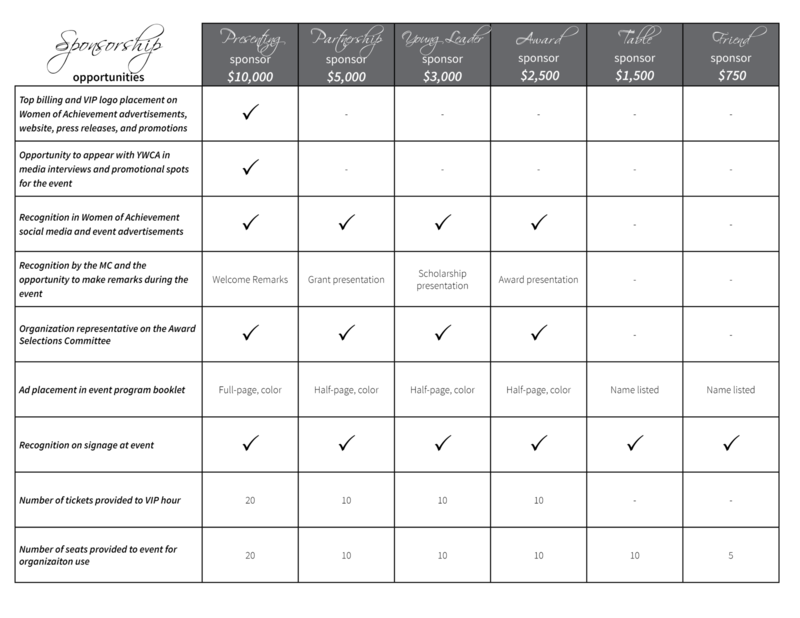 Sponsorship opportunities for the YWCA Lower Cape Fear's 34th Annual Women of Achievement Awards. Please enter exactly as you wish it to appear in marketing materials for the event. Please send an invoice to the contact listed above. I will mail a check, payable to the YWCA Lower Cape Fear.